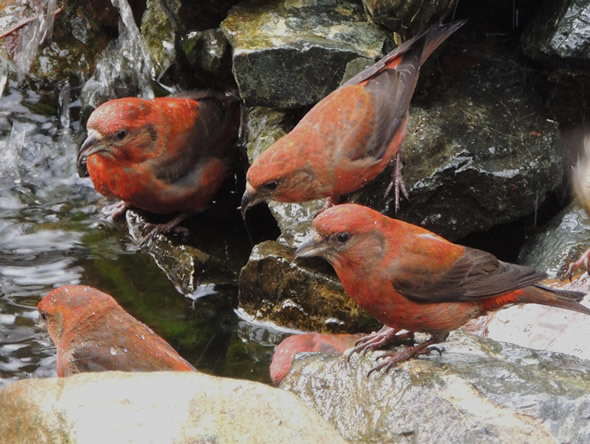 Male Red Crossbills spend a little time at a small pond and welcome you all this month. What animal causes the most deaths in the United States? 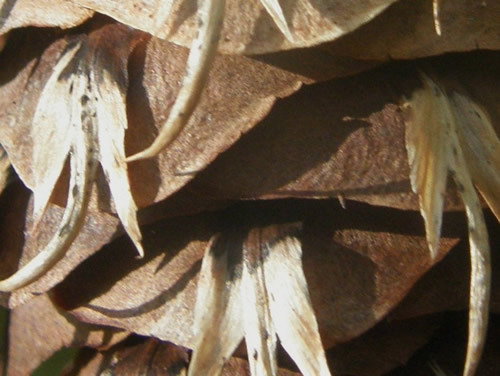 Here's another mystery close up mystery for you to solve. What on earth is this? 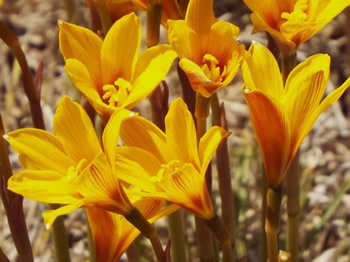 Flowers come in a variety of shapes. For example, some are shaped like bells; others like funnels or cups. 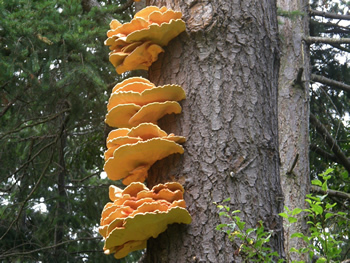 Often, they grow together in a cluster and there's a variety of types of clusters including spike-like clusters and branched clusters. 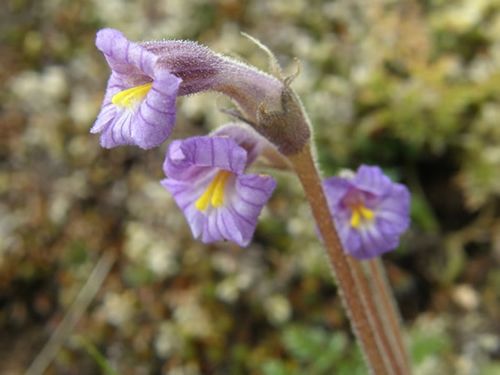 To learn a bit more about these shapes and clusters, check out this month's selected page: Flower Shapes and Clusters. 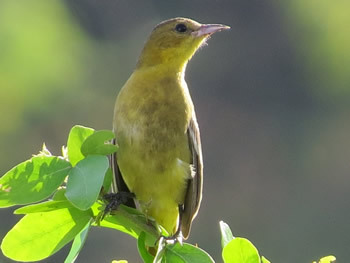 We have another bird from Mexico, a charming female Orchard Oriole, sent to us by Penny from Toronto. These lovely Fall Rain Lilies come to use from our friends at Red Gate Farm in Texas. 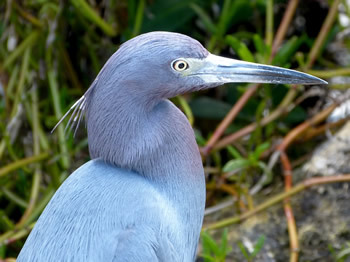 A rare one for us and a real treat to see is this Little Blue Heron from Marilyn Flanagan of Florida. 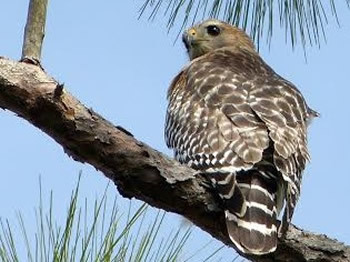 Marilyn also sent us this gorgeous Red Shouldered Hawk. 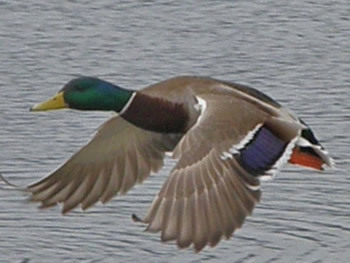 Herman Veenendaal of St Mary’s, Ontario, has sent us some great bird images. 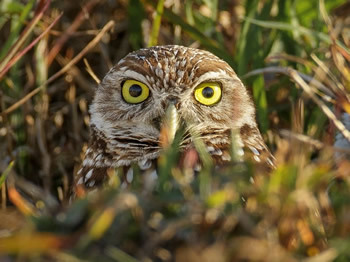 This is a Burrowing Owl. 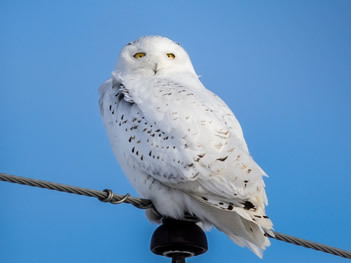 Herman also sent us another owl: Snowy Owl. What a great shot. Many thanks to Penny, Red Gate Farm, Marilyn and Herman for your fantastic photographs. We really appreciate you taking the time to send them to us for us all to enjoy. If you have a nature image for this section, please let us know! that are attracted to but get stuck in the sap. 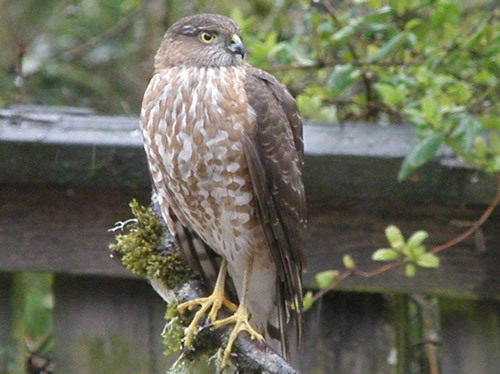 What do you think would be a good caption for this photo of a Sharp-shinned Hawk? #1 - "Oh dear, where have all the birdies gone?" #2 - "It's pretty lonely here all by myself." Thank you Yvonne for joining in the fun! 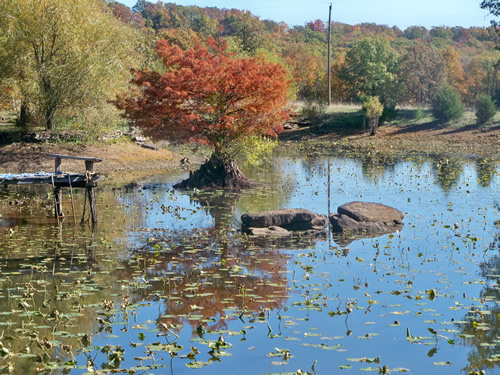 This calm, beautiful spot is in Winslow, Arkansas, was was sent for all of us to enjoy by Joyce Cahill of Winslow. Over the years of this newsletter we have always loved wonderful scenes that you have sent in to us for this section. It's always a pleasure to be taken away to a new place in nature. If you have a scene of a special natural place, we'd really love to hear from you! Just send us a quick e-mail, as well as a little description of the spot. Thanks! ___A large, tough bear stood by an office machine holding some paper and growling with frustration. He was extremely perplexed as he just couldn't figure out how to get the machine to go. A deer came wandering along, minding her own business. ___"Oh, my lovely," he said gently. "I was wondering if you could help me out on this beautiful day." 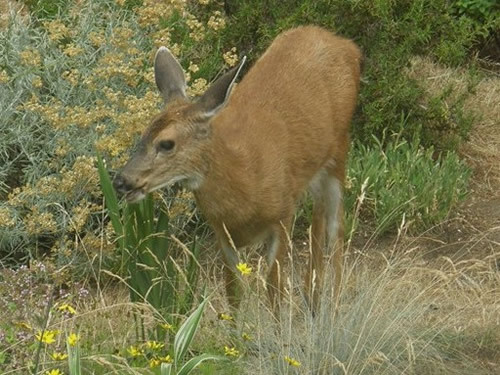 ___The deer cautiously nodded, "Yes." Although a little suspicious, she realized that perhaps it would be wise to help out this powerful beast of the forest. ___"Thank you, so much," said the grateful bear. "You see, my secretary is off for the day and she knows how to use this thing, but I'm at a loss. Can you help me with it?" ___The deer quickly plugged it in and the paper immediately went through the shredder. ___"That's fantastic," said the bear in amazement. "Could I have two copies please?" 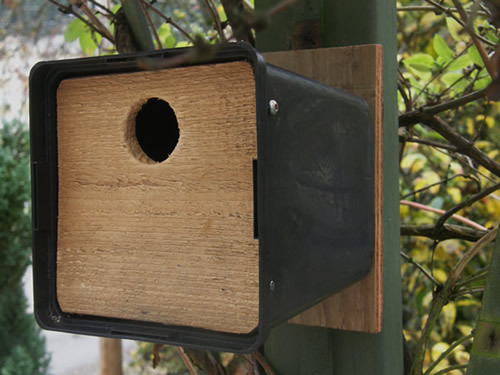 It's time for our third annual Nest Box Festival! We hope you'll be able to join us in the fun. Find out all about it here. 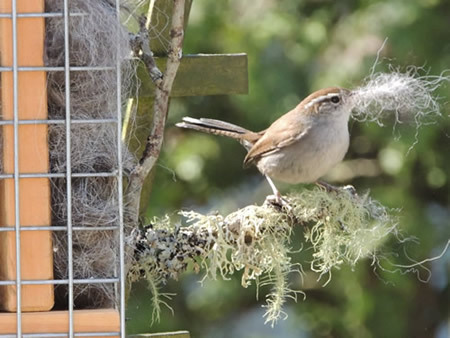 simply stuffing a suet block cage with hair, dog fur, laundry lint and similar stuff then hang it out. To make an interesting holder, check out our idea here. 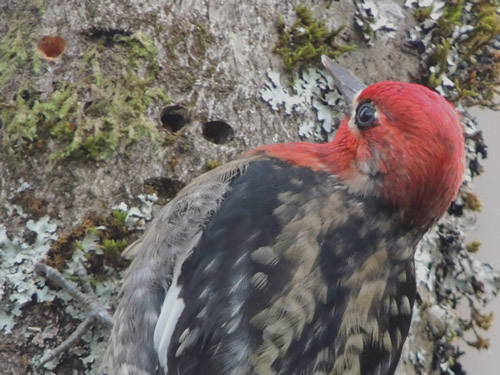 The Downy and Hairy Woodpeckers are very similar in appearance and it's often hard to quickly tell the difference. The two are different in size with the Hairy being 2-3 inches longer. But when just one of them visits, it's hard to compare the size. 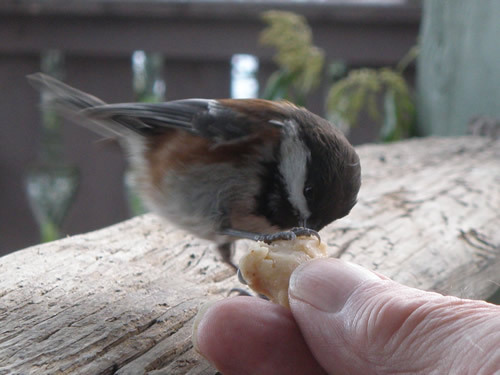 A handy way of identification is to use the bill. 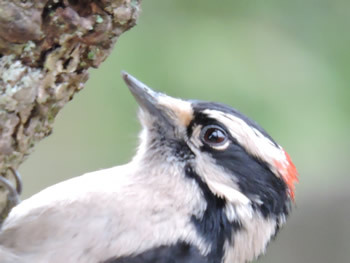 The bill of the Hairy Woodpecker is about the size of its head (left photo). 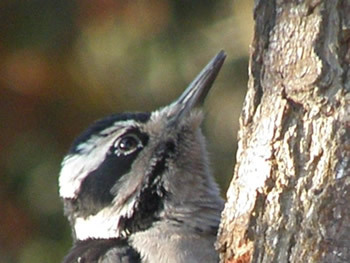 The Downy's bill (right) is much shorter and only about half the size of its head. Be sure to celebrate Earth Day on April 22. 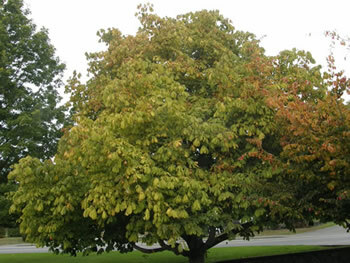 It's Arbour Day in the United States on April 24 this year. Get more details here. 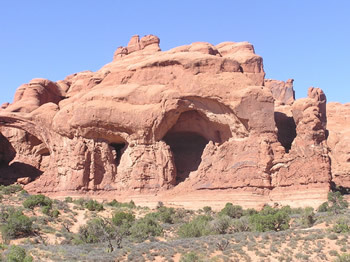 Western North America. 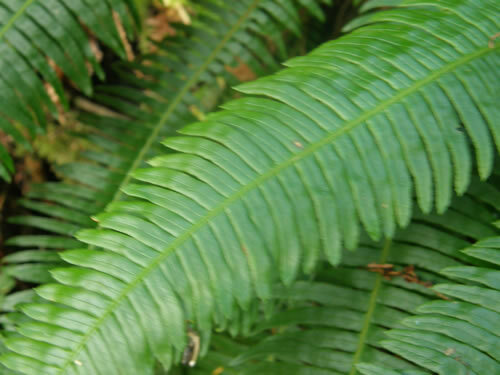 It has two types of fronds: vegetative fronds (above) and reproductive fronds. 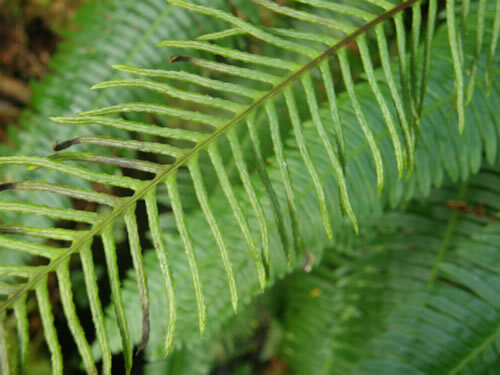 The reproductive fronds (above) rise from the centre of the plant in the fall. These fronds differ considerably when compared to the vegetative fronds. 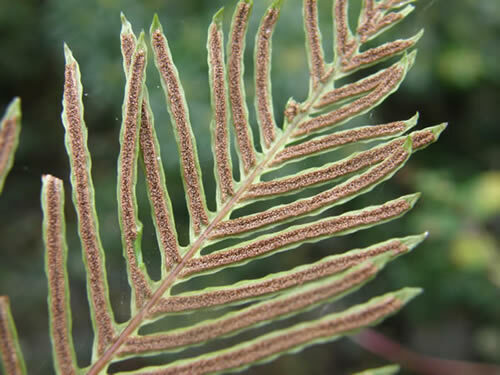 The underside of these reproductive fronds carry the clusters of spores. state mushroom in 1999. 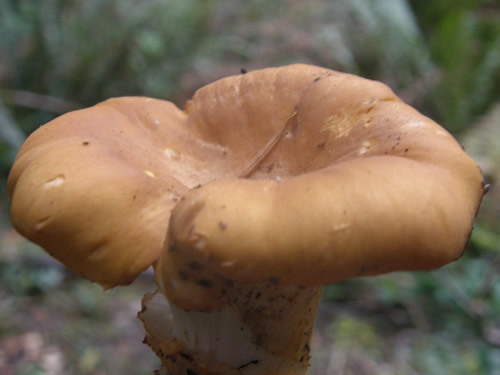 The only other state with an official mushroom is Minnesota. 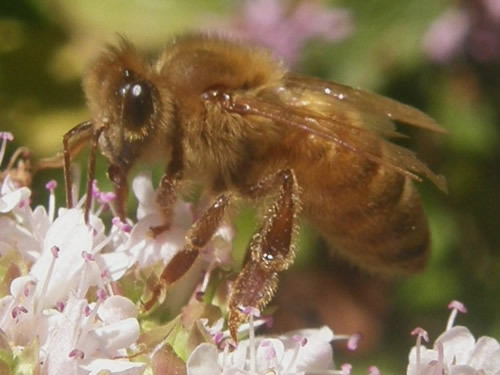 In the animal kingdom, bee stings kill the most humans in the United States. 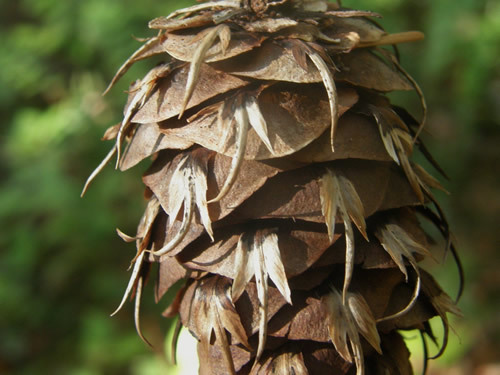 The Douglas-fir cones with its tell-tale "rats tails" is our close up this month.